That was written in the early days of the Internet, and the pace of change is accelerating – is education keeping up? Otto Scharmer’s book Leading From the Emerging Future: From Ego-systems to Eco-Systems enable us to answer this question. He traces the development of society and economics through four developmental stages and elaborates on some core services such as banking, education and health. He identifies those four stages as they manifest in education and health. Society 1.0 was traditional society based on hierarchies. In the second stage, the free market emerged as influential player. Stakeholder awareness develops at stage 3.0 when NGOs emerge to moderate the impacts of the state and the free-market. These three stages are all conflictual and participants mostly seek individual or group advantage, usually at the expense of others. 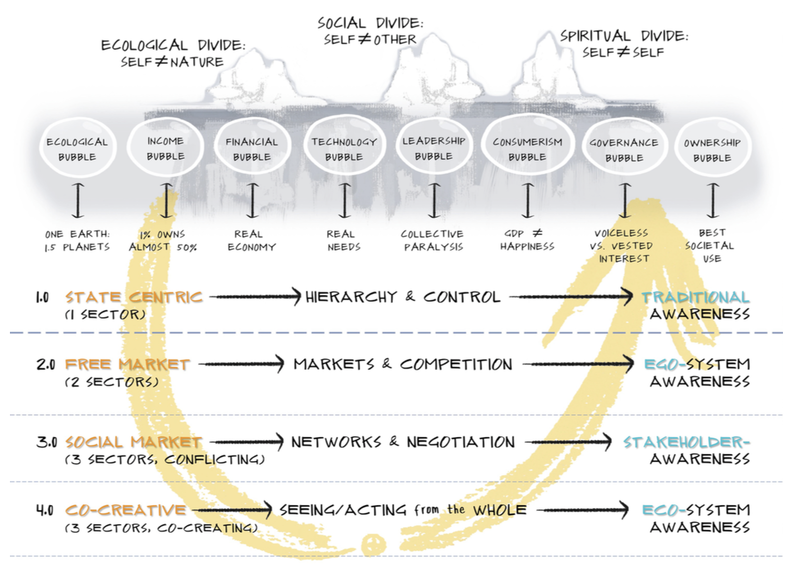 Otto Scharmer anticipates the emergence of stage 4.0, the co-creative economy, where the same key players operate, but in a radically more collaborative manner, driven by the knowledge that our destiny depends on our collective ability to correct the excesses that are threatening our existence on this planet. The table traces the evolution of health and education systems across these four stages. Alarmingly, tertiary education (in New Zealand) seems to be struggling to progress from stage two. State control is choking initiative out of the system and a testing ethos prevails with a growing burden of compliance costs. Stage 4.0 promises an alluring vision of the co-creation of education. This is detailed in depth in chapter eight of his book, available as a free download at his website. He sketches the future of education and provides what could be regarded as a global graduate profile. What we want to see is nothing less than transformative — graduates who are genuine human beings, realizing their full and true potential, caring for others — including other species — ecologically literate, contemplative as well as analytical in their understanding of the world, free of greed and without excessive desires; knowing, understanding, and appreciating completely that they are not separate from the natural world and from others — in sum manifesting their humanity fully. Here is Otto Scharmer elaborating on the challenge of developing the co-creative society. Those best positioned to realise this co-created education are the educators – provided they are eager to step into their new roles as “midwives” of learning. If you are an educator, or have interest in the emergence of a collaborative society, please comment and move the conversation forward. Renate Nummela and Geoffrey Caine quoted in The Learning Revolution by Gordon Dryden and Dr Jeannette Vos (1993). This entry was posted in Communication and engagement, Conscious capitalism, leadership, Sustainability and tagged Co-creative society, collaborative economy, Otto Scharmer, tertiary education. Bookmark the permalink.